WHEN Capt. G. T. R. Hill first conceived the idea of the "tailless" aeroplane, his ДальшеMore>>> main objective was an aerodynamic rather than a military one. He, like most of us at the time, was distressed at the thought of the number of accidents, mostly fatal, which were resulting from stalls followed by spins. His first machine appeared in 1926, and was driven by a Bristol "Cherub" engine, a small flat twin air-cooled of some 30 h.p. Since those early days Capt. Hill has worked away quietly at the task of developing and perfecting the ''tailless" principle. Some years ago he joined the Westland Aircraft Works at Yeovil, and with that move fresh impetus was given to the development programme. Several types of "Pterodactyl" have made their appearance, and one or two have appeared at Royal Air Force Displays at Hendon. It was somewhat unfortunate that they were always included among unorthodox aircraft. The result was that in the mind of the general public such machines as the Handley-Page "Gugnunc," the Cierva "Autogiro," and the Hill "Pterodactyl," came to be regarded as jokes, as something introduced to give "comic relief." Actually, all three types have their very serious purpose, and each of the three marks a contribution to the general endeavour towards better and safer aircraft. The Westland-Hill "Pterodactyl" series has reached the Mark V stage. 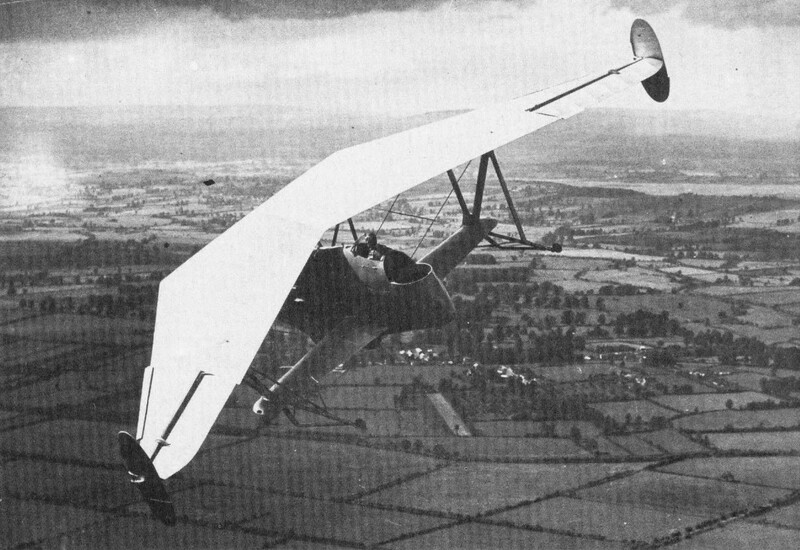 In Flight of August 16 we published the first photograph to be released of this machine, a two-seater fighter fitted with the 700 h.p. Rolls-Royce "Goshawk" steam-cooled engine. 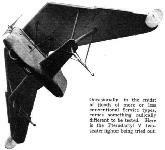 Previous to the introduction of this new military type, the most powerful “Pterodactyl" built had the 120 h.p. "Gipsy Three" engine. It will thus be seen that in going from this to the Mark V a very bold step was taken. A visit to the Westland works at Yeovil last week for the purpose of witnessing test flights indicated that the courage of the designer and constructors appears to have been rewarded with success. The new machine handles well, both on the ground and in the air; and, although performance figures may not be quoted, it was obvious that the speed range of the “Pterodactyl V" is very great. The machine is of so unusual appearance that it is a matter of some difficulty to judge its speed, but there could be no doubt whatever that its landing speed was very low, while the top speed appeared to be nearly the same as that of comparable types of orthodox design. With the behaviour of earlier “Pterodactyls” in mind I must confess that I went to Yeovil last week with a certain feeling of uneasiness when I thought of the ground performance. The short wheelbase of a "tailless" machine is apt to make taxying a somewhat precarious proceeding. 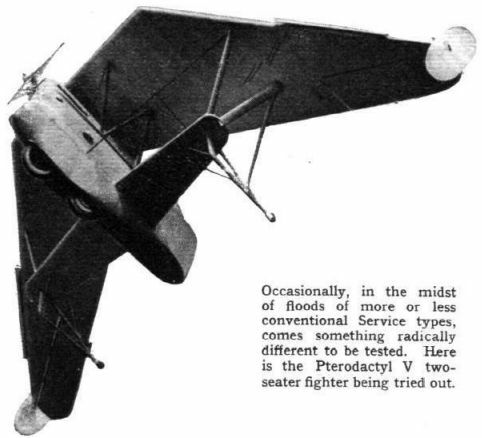 In the latest version we have a military machine of very high power and considerably greater weight than any “Pterodactyl” hitherto built, and if it is to be of any practical use such a machine must be able to operate from any makeshift aerodrome which war conditions will impose. A fairly strong wind was blowing when the machine was wheeled out, and hand-holds on the lower wing tips conjured up visions of running and perspiring helpers doing their level best to keep up with an aeroplane being taxied at a fairly good pace. 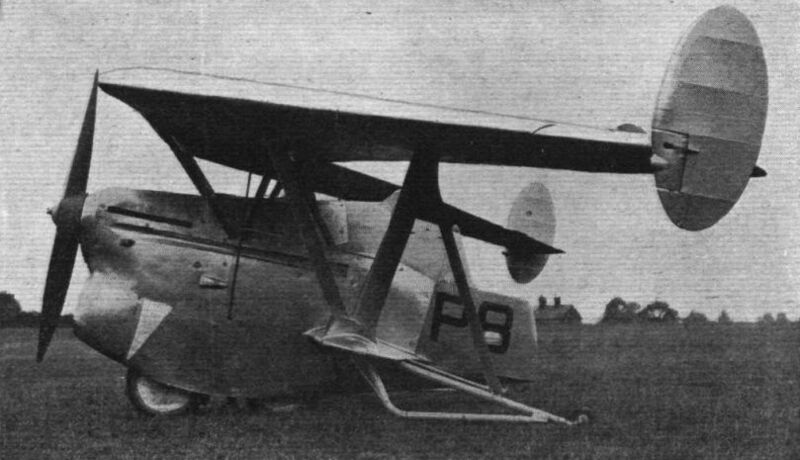 Instead of which, when the engineers had run up the "Goshawk" to prevent it from shivering in the rather cold wind, Mr. H. J . Penrose, Westland's chief test pilot, calmly turned the machine side to wind and taxied off, later turning to the wind what would have been the tail if the machine had had one, until the far side of the aerodrome was reached. The machine was remarkably steady on the ground, and the undercarriage arrangement which has been evolved for it seems to answer very well. It consists of two main wheels in tandem, working on the bogey principle, of which the front one is steerable, while the rear one is provided with brakes. To support the wing tips two slightly complicated skids are used, each carrying a small wheel. These two skids not only prevent the machine from leaning over laterally, but act also as tail wheels, there being no wheel or skid under the stern of the short central fuselage or nacelle. During the next half-hour or so Mr. Penrose put the "Pterodactyl V" through its paces. I do not mean that he did loops and rolls, etc., but he flew past at high speed and he flew past at low speed; he dived and he "zoomed"; he flew around in tight, steeply banked turns. His unpleasant experience over Martlesham the other day, when a wing of the machine he was flying broke off during a terminal velocity dive, and he had to depart per Irvin parachute, did not seem to have affected his nerve or even his nerves. Incidentally, the visit to Yeovil served to remind one what a very fine test pilot Mr. Penrose has turned out to be. 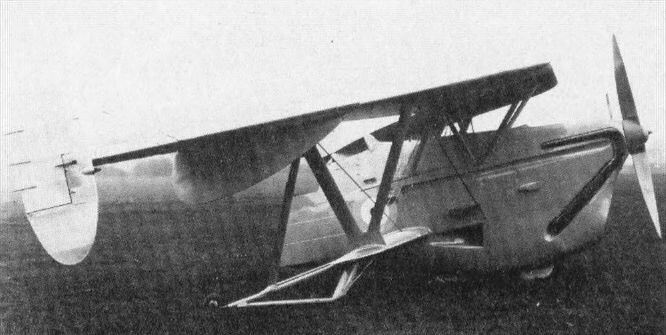 As the “Pterodactyl” was first dived towards the aerodrome, and then "zoomed" nearly vertically, it was impossible not to feel that here was a type of aircraft which, in addition to its advantages as a two-seater fighter, would be a formidable weapon for "strafing" objects on the ground. During the dive towards the ground the two machine-guns operated by the pilot could be brought to bear. After a rapid flattening out turned into a steep climb, the rear gunner could rake quite an area with his gun, the angle of climb giving him all the field of fire he could possibly want. From a military point of view, the "Pterodactyl V" has an advantage over the orthodox aeroplane in that the rear gunner can cover practically the whole of the rearward hemisphere with his machine gun. The only obstructions toward the side are the wing-tip rudders. They are not of great area, and if an attacker were trying to "hide" behind one of them, he would be visible to the pilot, who would then only need to lift that wing tip to bring the other machine into full view and field of fire. Owing to the steep slope of the stern of the nacelle, the rear gunner can fire straight downwards while the machine is flying level, and a little manoeuvring by the pilot will quickly bring into view any object which may be in need of "spraying." Close team work by pilot and gunner is facilitated in the "Pterodactyl" by the fact that the two cockpits are very close together, although on slightly different levels. In this respect the machine should be as good as the old Bristol Fighter of the war period. Aerodynamically and structurally it is a little more difficult to express an opinion of the "Pterodactyl V." The design avoids the drag of the tail, and the two main undercarriage wheels are in tandem, and, moreover, almost entirely enclosed, so that their drag must be very low. Against that one has the two wing-tip skid structures, which look capable of producing quite an appreciable drag, and the "blister" under the front part of the nacelle, caused by the condenser. This might disappear if surface coolers were fitted. 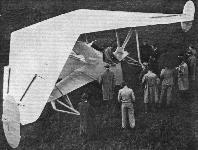 The upper wing is very thick over part of its span, although thin in the centre (to give the pilot a good view), and may be of slightly higher drag than the top wing of a normal biplane. On the other hand, the lower wing is diminutive in size, chord as well as thickness, and probably does not add a great deal of drag. On the whole, I think one would guess the “Pterodactyl V" to have about the same drag as that of an orthodox biplane of the same size and carrying the same load. If the weight is about the same as that of a comparable normal type, the performance should then also be about the same, with the extra advantage of the remarkable field of fire, which is unequalled in any normal two-seater, and only surpassed in a heavy night-bomber multi-seater with a gun position in the extreme stern. Whether or not the structure weight of this machine is greater than that of the straight biplane I cannot say. The fact that the upper wing has a pronounced change of direction in its front spar should tend to make for extra weight, but the load distribution over a back-swept wing may be very peculiar, and may tend to relieve this load, or it may have the effect of aggravating it. Mr. H. A. Mettam, in charge of the stress department at Westlands, must have had an interesting time calculating the stresses. His mouth is, however, sealed for the present owing to the fact that the "Pterodactyl V" is still on the Air Ministry's Part Publication List, which stipulates that no mention may be made of the internal structure or of weights, etc. Altogether, the Westland-Hill combination, as exemplified in the “Pterodactyl V,” has produced something which should contribute a good deal, not only to the knowledge of aircraft design, but also to the military effectiveness of British aircraft. At a time when the expansion of the R.A.F. is beginning, this is something to be grateful for. New ground has been broken, and whether the experiment is a complete or only a qualified success can only be known after extensive tests. But it is good that the attempt should have been made. This exciting air-to-air shot of the Pterodactyl V gives a clear impression of the wing planform and rear gunners position. THE NEW "PTERODACTYL V": With its Rolls-Royce "Goshawk" steam-cooled engine of some 700 h.p. this machine has a very wide speed-range, and the fighting view and field of fire are uncommonly good. EX CATHEDRA: Capt. G. T. R. Hill explains the features of the new "Pterodactyl V." Note the balanced wing flaps and the auto slots. The rudders move outwards only. 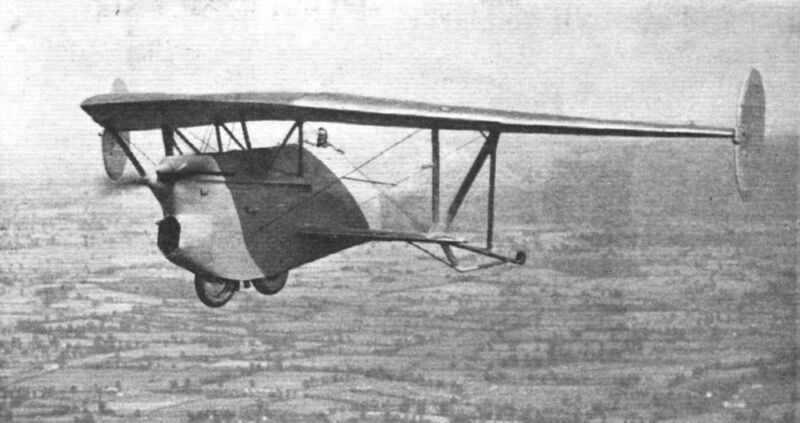 The first form of the Mk V, with manufacturers marking P8 and no fin area on the wing tips. 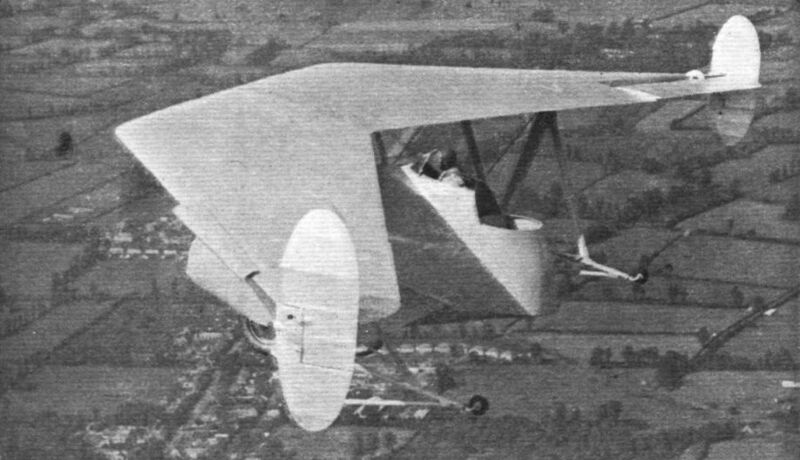 THE FIGHTING "PTERODACTYL": Probably never before has a military type of aeroplane been produced in which a crew of two has been given such unrestricted fighting view and field of fire as in the new Westland-Hill "Pterodactyl V." This two-seater fighter is fitted with the Rolls-Royce steam-cooled "Goshawk" engine of 600 h.p. or so, and should be a formidable opponent from a performance and a fighting point of view. The Mk V with fins added to the wing-tip rudders and a fresh coat of paint. The original angular intake remains. 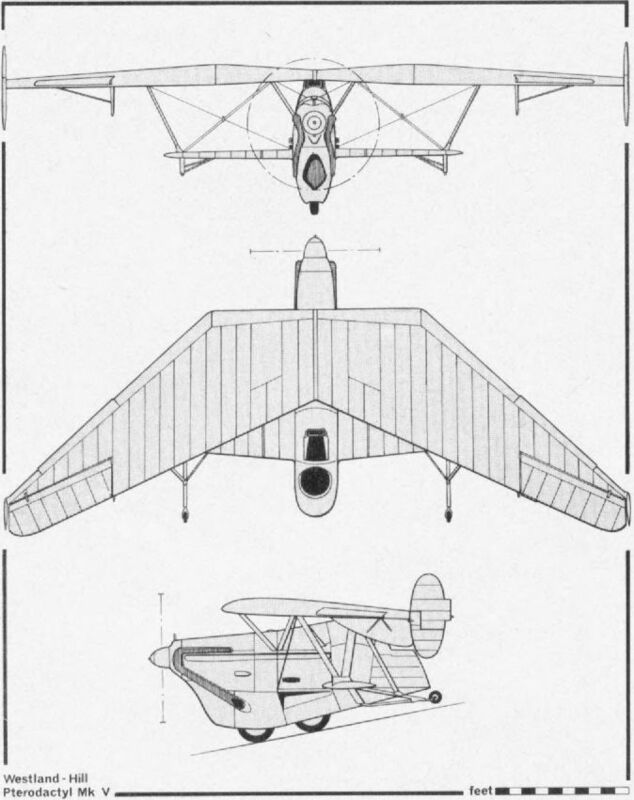 UNUSUAL PLAN FORM: This is the first "Pterodactyl" to have a straight leading edge in the centresection. The engine is a Rolls-Royce steam-cooled "Goshawk." The fully aerobatic Pterodactyl Mk V was powered by one 600 h.p. Rolls-Royce Goshawk engine. CLEAN DESIGN: Note the wheels in tandem and partly enclosed. The wing is thinned down in the centre to improve the view forward. In its final form, the Mk V had a much extended nose, revised exhaust system and additional underwing fins. THE TEAM RESPONSIBLE FOR THE "PTERODACTYL V": Mr. H. J. Penrose, test pilot; Sir Ernest Petter, chairman of the company; Capt. Hill, designer; Mr. Mettam, in charge of the stress department; and Capt. Keep, general manager. 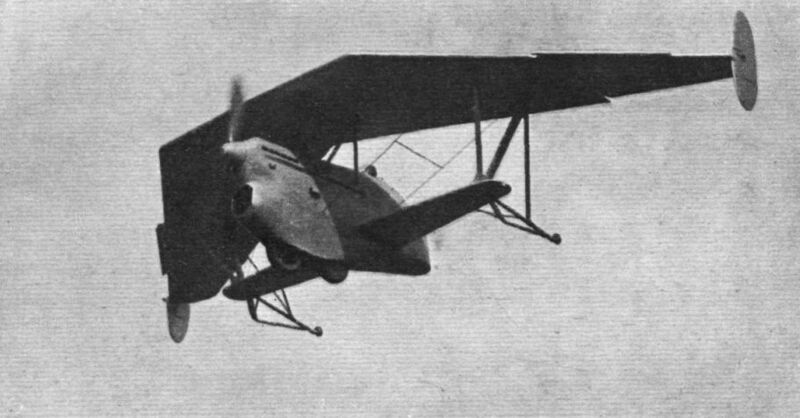 The penultimate Pterodactyl, the Mk VII, was a twin-engined flying boat. It never passed beyond the project stage.